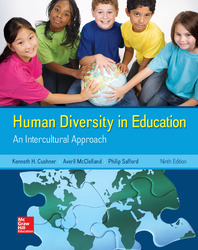 Human Diversity in Education: An Intercultural Approach prepares teachers and other human-service providers to teach and interact more effectively with the diverse pool of students they are certain to encounter, and help them to create an accepting and welcoming learning environment for all. It uses a research-based approach with cross-cultural and intercultural emphasis. The ninth edition provides a broad treatment of the various forms of diversity common in today's schools, including nationality, ethnicity, race, religion, gender, social class, language acquisition and use, sexual orientation, health concerns, and disability. Where are You, and Most Teachers, on the Intercultural Continuum? How Do We Achieve the Cognitive Demands Required for a Global Mind-Set? Is Technology Facilitating a Global Mind-Set? What, Specifi cally, Should Students Study? Case Study: I Never Expected Such a Firestorm! Who Decides, Federal or State?